How to convert DWG to PDF and specify width and height? In this article, I will show you how to convert DWG to PDF and specify width and height. The software I used is named as VeryPDF DWG to Vector Converter, by which you can also convert DWG files and DXF files, to PDF or vector image files in the formats like WMF, SWF, EMF, PS, SVG, EPS, XPS, HPGL, and PCL. In the following part, I will show you how to use this software. When downloading finishes, there will be one exe file. You need to install this software by double clicking the exe and follow installation message. Once the installation finishes, there will be an short cut icon on the desktop. Please launch this software by double clicking the icon on the desktop. The following snapshot is from the software interface, please have a check. Checking from the software interface, we can feel how easy to master this software usage. Step 2. Convert DWG to PDF and specify width and height. When you use this software, please add DWG file to PDF file. 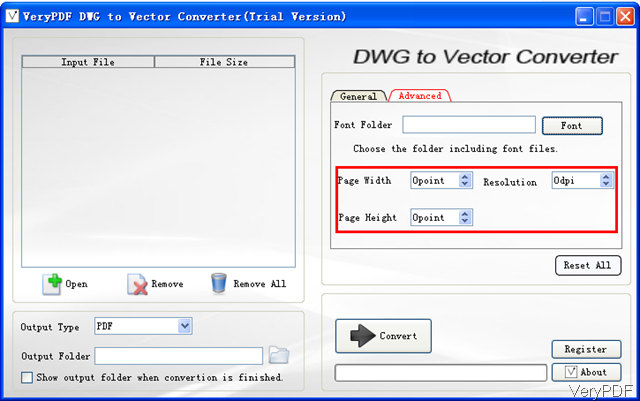 You can click button Open or simply drag DWG files from its containing folder to add input file to software interface. Then choose output format as PDF in output Type. In the right part, please go to tab of Advanced then you will find options of setting page width, resolution, page height. Here you can specify width and height for the output PDF file. This software also allows you to output font in a specified folder. When you finish setting part, please click button Convert to run the conversion. A few seconds later, you will find the output PDF file in specified output folder. When you do batch conversion, there is no limit about how many input files could be added. And this software supports all version DWG file and DXF files. 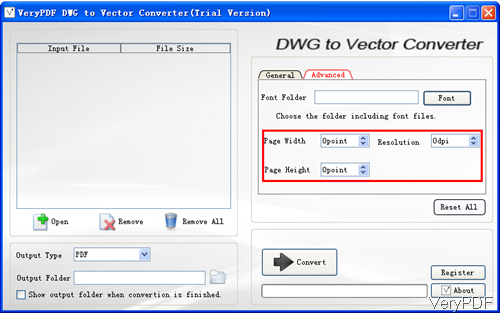 By converting DWG to PDF, we can protect DWG file in the format of PDF, say you can add password to PDF, add water mark to PDF and do many limitations. Then no matter sending DWG file in the format of PDF to any where, any one, you do not need to worry , file will be changed without your permission. Meanwhile, this software also can be used to convert DWG file to various images, you do not need to change anything in the usage, simply choose the proper output formats you need then you can run the conversion successfully. During the using, if you have any question, please contact us as soon as possible. This entry was posted in DWG to Vector Converter and tagged dwg to pdf. Bookmark the permalink.